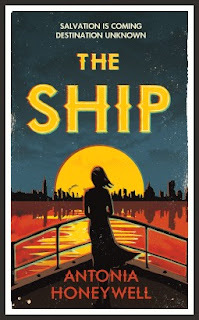 Book Drunk: Review ~ The Ship by Antonia Honeywell. Publication Date: February 19, 2015. Source: Curtis Brown Book Group review copy. Children of Men meets The Handmaiden's Tale: a dystopian epic about love, friendship and what it means to be free. Welcome to London, but not as you know it. Lalla, 16, has grown up sheltered from the new reality by her visionary father, Michael Paul. But now the chaos has reached their doorstep. Michael has promised Lalla and her mother that they will escape. Escape is a ship big enough to save 500 people. But only the worthy will be chosen. What does her father really want? The Ship was the novel I’d most been looking forward to in 2015. It sounded like an immense, captivating story and something completely unlike anything I’d read before. Antonia Honeywell has written a wonderfully enchanting novel, with a theme I found as thought-provoking as they come. When London as it is known is torn apart, no longer simply under threat but burned, bombed and destroyed, Michael and Anna, along with daughter Lalla, decide to escape. There is no life to be lived in London and so they board the ship, which is there to take 500 people away from the tragic life they once knew, into a happier, more fulfilling future. The ship theoretically contains everything needed to survive, and those on board feel thankful for the salvation they’ve been provided with. The Ship is one of those mind-blowing stories that I could not stop thinking about. It was an unforgettable look at the future, with characters that get under your skin and a style of writing I could not get enough of. The world building throughout this novel was fascinating. It wasn’t overdone or over-detailed but it did paint a pretty startling picture and leave me considering how far into the future it was set and comparing it with the world we live in now. Each person on the ship, except maybe for Michael and Anna’s daughter, had their own story to tell, their own kind of horror story. There were some shocking stories that have a sense of realism to them, which then in turn gave this book a haunting feel. Everything led to more questions, the craving for more and more detail. Everybody, once on the ship, seemed so happy and question-free, but why? Lalla is the teenage protagonist who though at times isn’t the easiest character to get along with, I was supporting her all the way through her journey of discovery and it felt to me like her heart was always in the right place, even if through her naivety, her choices sometimes left a lot to be desired. Under her parents care, Lalla has lived a bit of a sheltered life and there’s a lot she has to learn about life. Understandably, after she’s faced with some devastating trauma, she’s left with a lot of questions. At times she reminded me of a young child - asking a question but too busy thinking of the next question to hear the answer, firing out question after question. She repeated herself a bit at times, in a way which made me question why she didn’t receive a straight answer and think about how things may be been hidden from her. How much protecting does a sixteen year old really need from a world everybody else seems to be perfectly content with anyway. I liked watching her grow throughout this novel though as she came to have more knowledge on life and learn to ask more intelligent questions. She didn’t take things as they came – she always wanted to know more and I liked this aspect to her, how she wouldn’t let things go when she was fobbed off and how she wouldn’t go along with the majority just because she was meant to. When everybody else on the Ship seemed to be happy and grateful, she wouldn’t just accept that, not even when she was told that’s how she should feel too, that she was lucky. Her mentality to want to understand things for herself was appealing to me and led to some of the more interesting aspects of the novel. Other things I loved about The Ship, briefly, else I’d be here all day. Lalla and Anna’s connection through the British Museum, where Lalla is educated, where she watches as item after item disappears. The brief suggestion of what’s to come, under each chapter heading. This piqued my interest every time, a few small words and my mind was working, trying to predict how each chapter would turn out. The evocative imagery that the author so beautifully used, leaving a lasting impression on me each time. The author’s writing in general I found stunning and I’m excited for anything else she may write in the future. There were parts of this novel I would have loved to learn more about, parts that I would have loved to see explained more. Not, for me, because the story is under-developed but more because the author’s beautiful writing is so compelling and so interesting, I was always thinking about it and always wanting to learn more about the dystopian world in The Ship. Much like Lalla, I was left with questions every time I put this book down. Questions that may remain unanswered, questions which are left for me to decide the answers to and questions that each reader may find a different answer to. Lots of questions – but aren’t the best books the ones that make you think long after you’ve turned the final page? Sounds like an excellent debut Sophie, fab review.